Despite the widespread adoption of the digital medium, print remains pivotal. So much so that it’s set to be a $300 billion industry by 2024. Advances in print technology have drastically brought down the cost, made it accessible and has opened up a whole new world of possibilities. When done right, Digital marketing, in tandem with print can get you the results that you’ve always wanted. Here are few ways to incorporate print media into your digital marketing campaign. It’s now an established fact that people are a lot more receptive to direct mail than promotional emails. People also have an affinity towards printed catalogs. Given that the cost of catalog print is now lower than ever before, it’s a good idea for small businesses to embrace it. Now, setting up a digital opt-in for direct mail subscription is even better. 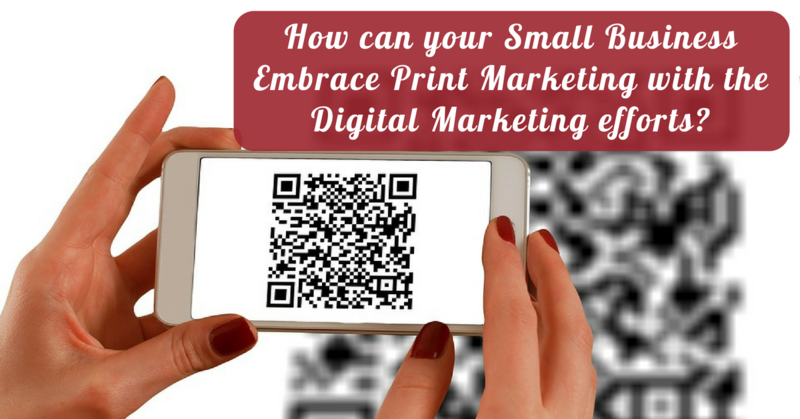 If there’s one cost-effective solution that bridges the gap between the real and digital worlds, QR codes have to be it. Generating these codes is pretty straightforward and can be accessed universally by pointing a smartphone towards them. Moreover, the chances of a potential customer scanning a QR Code and visiting your URL are spectacular, compared to an in-browser click. With social media making rounds, it’s best to include them as you strategize your campaign. A call-to-action on a flyer, asking people to be a part of your social circle increases reach. Moreover, a printed call-to-action offers a sense of trust and reinforces the idea that your digital presence and the real world aren’t all that different. If you are planning to embrace print marketing for your business, you need to develop a strategy and choose the right printing partner. Smart Resolution – Your Online Printing Partner!